Find cheap flights from Auckland to the Islands of Tahiti and you'll find sky-high volcanic mountains, lush rainforests and aquamarine lagoons accompanied by an alluring Frenchness you'll find irresistible. Throughout history, the islands of French Polynesia have entranced travellers from all over the world. The crew of Captain Cook's Endeavour were so captivated, they got local tattoos. Gauguin captured Tahiti and its beauties in paintings that changed art forever. Marlon Brando shot a movie on Moorea, married a local and bought an island. Today, The Islands of Tahiti can mean the last word in luxury or an affordable-yet-stylish Pacific escape. Our research will make it easier for you to find your perfect French Polynesian vacation. 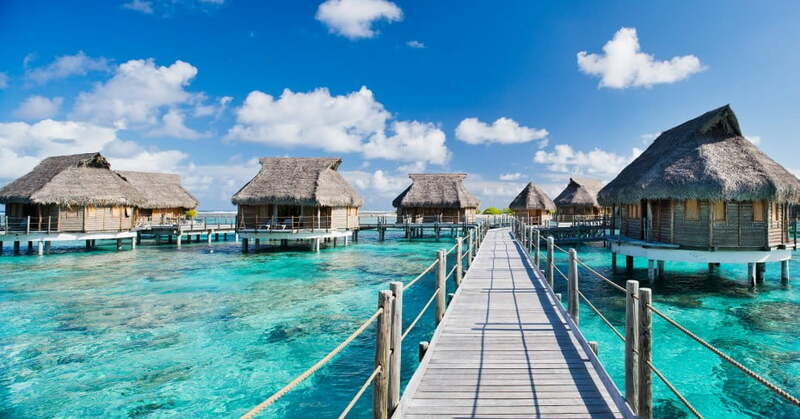 Tahiti is the main island of French Polynesia, a group of islands and atolls in the eastern Pacific. We operate non-stop flights to Tahiti direct from Auckland several days a week and also offer flights operated by our codeshare partner, Air Tahiti Nui. Connections across our domestic network make it easy to access flights from Wellington and Christchurch to Tahiti or from anywhere else in New Zealand. On The Islands of Tahiti you can hike with a professional guide through the giant Hitiia lava tunnels. Hundreds of metres long, each one is like a lost underground world. For our flights from Auckland to Papetee Tahiti the scheduled flight time is five hours. The flight crosses the international dateline, so when you're planning a trip to Tahiti remember you'll arrive the day before you depart Auckland. On the return Tahiti to Auckland flights, you arrive the day after you depart Tahiti. On Air New Zealand operated flights you have a choice of fare types - Seat, Seat + Bag, The Works, Premium Economy and Business Premier™. If you're interested in cheap flights to Tahiti from Auckland, you can sign up to our newsletter to receive regular updates about fares, packages, competitions and exclusive offers. Assembling Tahiti holiday packages is easy on this website. During the flight booking process, you'll have the option of adding a rental vehicle. After you've completed payment, we'll offer you the chance to book accommodation through Expedia. Tahiti airport is a 20-minute drive from Papeete, the capital city of French Polynesia. To hire a car you simply need a full New Zealand driver's licence. In French Polynesia, they drive on the right-hand side of the road. If you'd rather not drive, most accommodation options offer convenient transfers. There are also taxis and a local bus service in and around Papeete. For our flights from Auckland to Tahiti the scheduled flight time is five hours. The flight crosses the international dateline, so when you're planning a trip to Tahiti remember you'll arrive the day before you depart Auckland. On the return Tahiti to Auckland flights, you arrive the day after you depart Tahiti. If you're interested in cheap flights to Tahiti from Auckland, we run regular special offers. You can sign up for alerts to receive early notice of cheap flights to Tahiti from New Zealand. You can also sign up to our email database to receive regular email updates about fares, packages, competitions and exclusive offers. Tahiti airport is a 20-minute drive from Papeete, the capital city of French Polynesia. To hire a car you simply need a full New Zealand driver's licence. In French Polynesia, they drive on the right hand side of the road. If you'd rather not drive, most accommodation options offer convenient transfers. There are also taxis and a local bus service in and around Papeete. While known for luxury hotels and over-water bungalows, The Islands of Tahiti also offer affordable family-run guesthouses known as pensions (pone-see-owns). 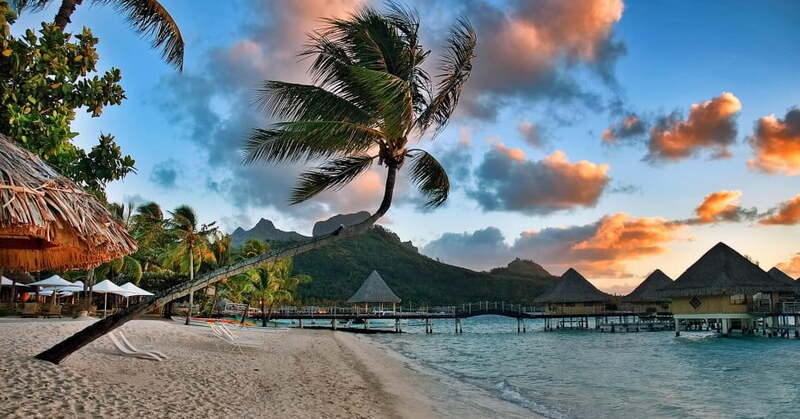 Many of the best white-sand beaches and lagoons are on the islands of Moorea and Bora Bora, however there are plenty of beautiful black-sand beaches around the coast of the main island. Wherever you choose to go, you’ll discover a delightful blend of French flair and Polynesian hospitality. On The Islands of Tahiti, start with Bain Lot Beach right in Papeete, which is within walking distance of many downtown hotels. Just east of town, the black-sand beaches of Plage Lafayette and Venus Point are popular spots for sunbathing and lagoon swimming. Along the west coast, beautiful Mahana Beach is a great choice for families. You can snorkel a reef close to shore before enjoying a snack or picnic in the nearby park. About half an hour south of Papeete, the palm-tree lined La Plage de Maui is a striking white-sand beach that's popular with locals on the weekends. On Moorea Island, the top public beaches are around Hauru Point and at Teavaro, where you'll find a long stretch of golden sand and shallow water ideal for children. If you've taken one of the flights to Bora Bora and are looking for a public beach, head to the southern end and the white sands of Matira Beach. Over a kilometre long and edged with palm trees, it's a gorgeous place for a swim and rated one of the best beaches in the world. In French Polynesia you're never far from an amazing underwater experience. It's one of the world's top dive destinations and the diversity of marine life is exceptional. From the marina, which is near the airport in Papeete, you can head out on boats for highly-rated lagoon and snorkel tours, including friendly encounters with sharks and stingrays. Most accommodation providers can point you to the best off-the-beach snorkelling spots or connect you with qualified local dive operators. On Moorea and Bora Bora there are perfect dive sites for beginners, as well as spectacular deep ravines for those seeking a challenge. Experienced divers also head to the Tuamotu Islands of Rangiroa, Tikehau and Fakarava. Some of the best dives there are in passes, riding currents of around four knots in visibility that’s more than 30 metres. Many images of surfing in French Polynesia feature big-wave reef breaks suitable for advanced surfers, like the world famous Teahupo'o (affectionately known as 'Choops'), but there are plenty of smaller reef breaks and easy beach breaks for gremlins and grommets. Of all the islands in French Polynesia, Tahiti, Moorea and Rangiroa are the most popular surf destinations. They attract top surfers from around the world, including Kelly Slater who has a home here. Hiring a local surf guide or taking lessons at a surf school will make it easy to find the best locations for your experience level and you'll get handy tips on how to surf them safely. Apart from the narrow band of flat land around the coast, Tahiti and Moorea are made up of steep, forest-covered volcanic mountains with numerous waterfalls cascading into rivers and pools. Cooler than the coast and beautifully refreshing, it's a side of the Islands of Tahiti you really shouldn't miss. The inland roads are unsealed tracks, so 4WD vehicles are required for exploring. Take a whole-day or half-day guided tour, like the Tahiti inner island safari, and you'll learn about the native plants and traditional way of life, while enjoying some of the best Tahiti sightseeing and a blissful swim beneath one of the waterfalls. On The Islands of Tahiti you can hike with a professional guide through the giant Hitiia lava tunnels. Hundreds of metres long, each one is like a lost underground world, with internal waterfalls, a river running along the floor and sunny secluded bathing pools between them. Another mountain adventure is canyoneering, where you hike to the top of a valley and rappel down rock-face waterfalls getting pummelled by the cool clear water. For thrill hunters it's high on the list of fun things to do in Tahiti. There are regular ferries and flights to Moorea, where the interior safaris include highly-rated quad bike (ATV) and 4WD tours. 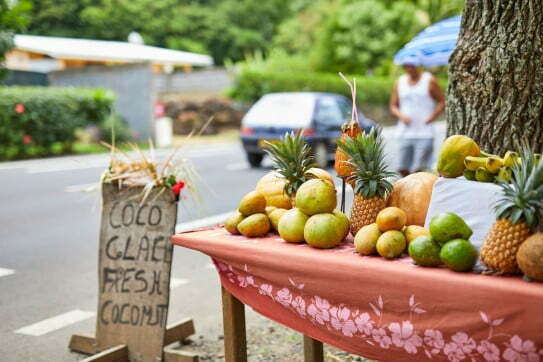 You'll see pineapple plantations, learn about local customs, taste fruit jams, ford streams and enjoy breathtaking views. Moorea also has some excellent hiking trails. They can be hard to find though, because the jungle grows fast, so it's a good idea to take a guided hiking tour. In French Polynesia, an abundance of fresh local fruit, vegetables, fish, chicken and pork is supplemented by a plentiful supply of imported staples and French delicacies. 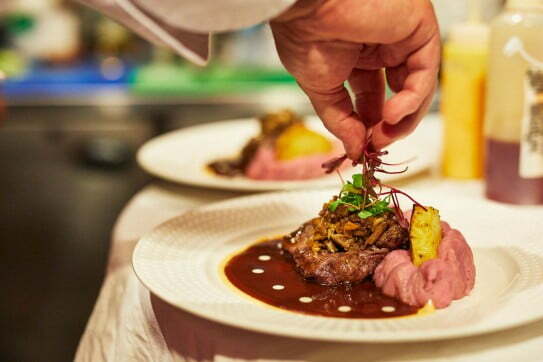 When you dine at the best restaurants in Tahiti, the experience is equivalent to eating in Paris, but with a tropical twist. You'll also find plenty of casual eateries serving French, Italian and Chinese cuisine at affordable prices. Traditional Tahitian dishes are delicious and readily available. Look for poisson cru, which is fresh raw fish marinated in lime juice and served with finely chopped tomatoes, onions, cucumber and coconut cream. If chilli is added it's known as Chinese poisson cru. The best fast food in Tahiti is casse-croûte, a mouth-watering meat and salad sandwich made with crusty French baguette. At most big resorts there's a weekly feast night featuring traditional food cooked in earth ovens. A dance show is part of the experience. Every evening, the waterfront of Papeete becomes a festival of flavours as food trucks (les roulottes) start serving Tahitian street food - fish, steak, crepes, filled baguettes and much more. Impromptu live music is part of the vibe. The large Municipal Market in downtown Papeete is a fun place to browse for fresh food, flowers, souvenirs and pearls. If you're interested in Tahitian pearls, you'll love the Robert Wan Pearl Museum, located across the road from the relaxing Paofai Gardens waterfront park. Wherever you're staying in Tahiti, if you feel like a picnic or a quiet night in, it's easy to make your own light meals by picking up some French bread, cheeses, vegetables and deli meats at a local grocery store. They also sell well-priced beer and wine. The local currency is tied to the Euro and costs tend to reflect European norms. While many resorts aim at the top end of the international market, there are special offers and family-run independent accommodation options, such as the guesthouses. No vaccinations are required to enter Tahiti unless you are arriving from or transiting through an area infected with yellow fever. However, it's still a good idea to check with your doctor before you depart. Dengue fever is a possibility, so using a tropical strength insect repellent day and night is recommended. For New Zealand, Australian, Japanese, U.S. and Canadian citizens, no visa is required to enter Tahiti if you're staying less than 90 days, but you must have return or onward tickets, sufficient funds to support yourself and a passport valid for at least six months.